A firefighter puts out a hot spot in Prince Albert National Park while fighting the Rabbit Fire in May 2018. Photo courtesy Parks Canada. 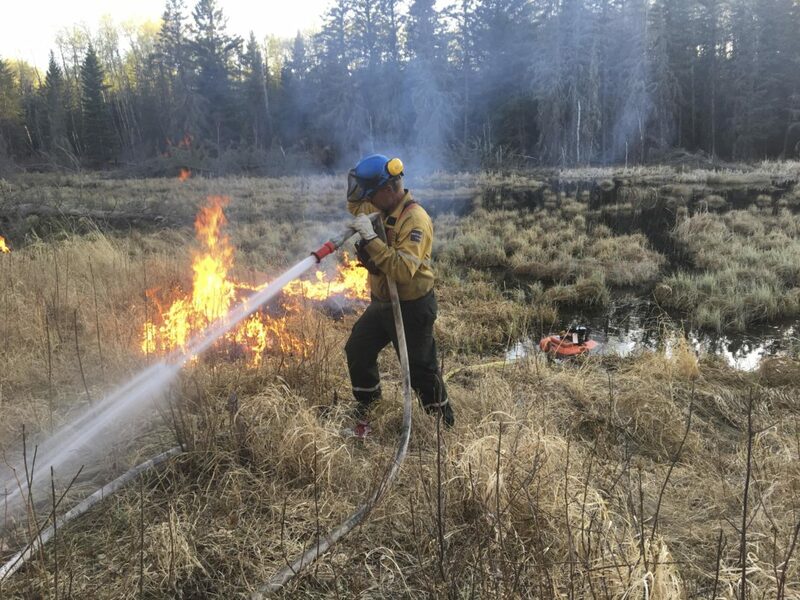 A wildfire burning in Prince Albert National Park hasn’t grown in several days, but officials aren’t quite ready to say the fire is under control. The fire is being held – meaning it is neither increasing nor decreasing in size – officials said during a conference call Thursday. “The fire has not grown since May 21,” said incident commander Jed Cochrane. The fire has been burning since May 6 when, during preparations for a prescribed burn, fire used to create control lines spotted away during unexpected high winds. That spotting eventually grew into a 36,000 hectare wildfire. Cooler temperatures and some much-needed rain have helped crews build containment around the fire. While at one point much of the publicly-accessible areas of the park were closed, most areas have been re-opened. The Narrows will reopen Friday, and a fire ban in the park will also be lifted at that point in time. The current fire risk in the national park is listed as low. Cookson Road in the southwest corner of the park remains closed to the public. Thursday, crews were using infrared scanning to identify hotspots for crews to attack. Cochrane thanked the many firefighters who have contributed to getting the wildfire contained. “Our ability to get containment of the fire at this stage is in a large part thanks to a coordination of efforts from multiple agencies across Canada,” he said. “We’d really like to thank the residents and businesses in Waskesiu and the residents outside the national park in the surrounding area for all the collaboration and support they’ve given us throughout the course of the fire, in terms of being in close contact with us and supporting us where they can,” he said. No structures were damaged in the fire. The only damage was a wooden fence. At its worst, it grew to within 20 km of the Waskesiu Town Site.